Diagram of new build rate. The first LNG carrier Methane Pioneer (5,034 DWT) left the Calcasieu River on the Louisiana Gulf coast on 25 January 1959. Carrying the world's first ocean cargo of LNG, it sailed to the UK where the cargo was delivered. Subsequent expansion of that trade has brought on a large expansion of the fleet to today where giant LNG ships carrying up to 266,000 m3 (9,400,000 cu ft) are sailing worldwide. The success of the specially modified C1-M-AV1-type standard ship Normarti, renamed Methane Pioneer, caused the Gas Council and Conch International Methane Ltd. to order two purpose built LNG carriers to be constructed: Methane Princess and Methane Progress. The ships were fitted with Conch independent aluminum cargo tanks and entered the Algerian LNG trade in 1964. These ships had a capacity of 27,000 cubic metres (950,000 cu ft). In the late 1960s, opportunity arose to export LNG from Alaska to Japan, and in 1969 that trade with TEPCO and Tokyo Gas was initiated. Two ships, Polar Alaska and Arctic Tokyo, each with a capacity of 71,500 cubic metres (2,520,000 cu ft), were built in Sweden. In the early 1970s, the US government encouraged US shipyards to build LNG carriers, and a total of 16 LNG ships were built. The late 1970s and early 1980s brought the prospect of Arctic LNG ships with a number of projects being studied. With the increase in cargo capacity to approximately 143,000 cubic metres (5,000,000 cu ft), new tank designs were developed, from Moss Rosenberg to Technigaz Mark III and Gaztransport No.96. In recent years, the size and capacity of LNG carriers has increased greatly. Since 2005, Qatargas has pioneered the development of two new classes of LNG carriers, referred to as Q-Flex and Q-Max. Each ship has a cargo capacity of between 210,000 and 266,000 cubic metres (7,400,000 and 9,400,000 cu ft) and is equipped with a re-liquefaction plant. Today we see interest for small scale LNG bunker carriers. Some need to stay below the life rafts of Cruise ships and Ropax vessels. 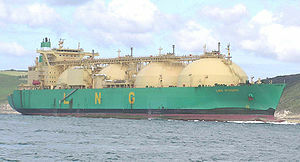 Examples are the Damen LGC 3000 ( http://products.damen.com/en/ranges/liquefied-gas-carrier) and the Seagas. First, the tank must be 'inerted' to eliminate the risk of explosion. An inert gas plant burns diesel in air to produce a mixture of gases (typically less than 5% O2 and about 13% CO2 plus N2). This is blown into the tanks until the oxygen level is below 4%. LNG is brought onto the vessel and taken along the spray line to the main vaporiser, which boils off the liquid into gas. This is then warmed up to roughly 20 °C (68 °F) in the gas heaters and then blown into the tanks to displace the "inert gas". This continues until all the CO2 is removed from the tanks. Initially, the IG (inert gas) is vented to atmosphere. Once the hydrocarbon content reaches 5% (lower flammability range of methane) the inert gas is redirected to shore via a pipeline and manifold connection by the HD (high duty) compressors. The shore terminal then burns this vapour to avoid the dangers of having large amounts of hydrocarbons present which may explode. The next stage is cool-down. LNG is sprayed into the tanks via spray heads, which vaporises and starts to cool the tank. The excess gas is again blown ashore to be re-liquified or burned at a flare stack. Once the tanks reach about −140 °C (−220 °F) the tanks are ready to load bulk. The vessel can now proceed to the discharge port. During passage various boil-off management strategies can be used. Boil-off gas can be burned in boilers to provide steam for propulsion, or it can be re-liquefied and returned to the cargo tanks, depending on the design of the vessel. Once in the discharge port, the cargo is pumped ashore using the cargo pumps. 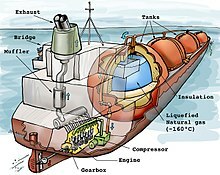 As the tank empties, the vapour space is filled by either gas from ashore or by vaporising some cargo in the cargo vaporiser. Either the vessel can be pumped out as far as possible, with the last being pumped out with spray pumps, or some cargo can be retained on board as a "heel". It is normal practice to keep onboard 5% to 10%[ citation needed] of the cargo after discharge in one tank. This is referred to as the heel and this is used to cool down the remaining tanks that have no heel before loading. This must be done gradually otherwise the tanks will be cold shocked if loaded directly into warm tanks. Cool-down can take roughly 20  hours on a Moss vessel (and 10–12 hours on a membrane type vessel), so carrying a heel allows cool-down to be done before the vessel reaches port giving a significant time saving. If all the cargo is pumped ashore, then on the ballast passage the tanks will warm up to ambient temperature, returning the vessel to a gassed up and warm state. The vessel can then be cooled again for loading. If the vessel is to return to a gas free state, the tanks must be warmed up by using the gas heaters to circulate warm gas. Once the tanks are warmed up, the inert gas plant is used to remove the methane from the tanks. Once the tanks are methane free, the inert gas plant is switched to dry air production, which is used to remove all the inert gas from the tanks until they have a safe working atmosphere. Today there are four containment systems in use for new build vessels. Two of the designs are of the self-supporting type, while the other two are of the membrane type and today the patents are owned by Gaz Transport & Technigaz (GTT). There is a trend towards the use of the two different membrane types instead of the self-supporting storage systems. This is most likely because prismatic membrane tanks utilize the hull shape more efficiently and thus have less void space between the cargo-tanks and ballast tanks. As a result of this, Moss-type design compared to a membrane design of equal capacity will be far more expensive to transit the Suez Canal. However, self-supporting tanks are more robust and have greater resistance to sloshing forces, and will possibly be considered in the future for offshore storage where bad weather will be a significant factor. Named after the company that designed them, the Norwegian company Moss Maritime, the Spherical IMO type B LNG tanks are spherical in shape. Most Moss type vessels have 4 or 5 tanks. The outside of the tank has a thick layer of foam insulation that is either fitted in panels or in more modern designs wound round the tank. Over this insulation is a thin layer of "tinfoil" which allows the insulation to be kept dry with a nitrogen atmosphere. This atmosphere is constantly checked for any methane that would indicate a leak of the tank. Also the outside of the tank is checked at 3 month intervals for any cold spots that would indicate breakdown in the insulation. The tank is supported around its circumference by the equatorial ring, which is supported by a large circular skirt, known as a data-couple that is a unique combination of aluminum and steel, which takes the weight of the tank down to the ships structure. This skirt allows the tank to expand and contract during cool-down and warm-up operations. During cool-down or warm-up the tank can expand or contract about 60 cm (24 in). Because of this expansion and contraction all piping into the tank comes in the top and is connected to the ships lines via flexible bellows. Inside each tank there is a set of spray heads. These heads are mounted around the equatorial ring and are used to spray Liquid LNG onto the tank walls to reduce the temperature. Tanks normally have a working pressure of up to 22 kPa (3.2 psi), but this can be raised for an emergency discharge. If both main pumps fail then to remove the cargo, the tank's safety valves are adjusted to lift at 100 kPa. Then the filling line which goes to the bottom of the tank is opened along with the filling lines of the other tanks on board. The pressure is then raised in the tank with the defective pumps which pushes the cargo into the other tanks where it can be pumped out. Designed by Ishikawajima-Harima Heavy Industries, the self-supporting prismatic type B (SPB) tank is currently employed in only two vessels. Type B tanks limit sloshing problems, an improvement over Membrane LNG carrier tanks which may break due to sloshing impact, therefore destroying the ship's hull. This is also of prime relevance for FPSO LNG (or FLNG). CS1 stands for Combined System Number One. It was designed by the now merged Technigaz and GazTransport companies and consists of the best components of both MkIII and No96 systems. The primary barrier is made of invar 0.7 mm (0.028 in), and secondary from Triplex. The primary and secondary insulation consists of polyurethane foam panels. Three vessels with CS1 technology have been built by one shipyard, but established shipyards have decided to maintain production of the MKIII and NO96. In order to facilitate transport, natural gas is cooled down to approximately −163 °C (−261 °F) at atmospheric pressure, at which point the gas condenses to a liquid. 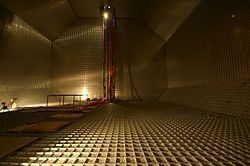 The tanks on board an LNG carrier effectively function as giant thermoses to keep the liquid gas cold during storage. No insulation is perfect, however, and so the liquid is constantly boiling during the voyage. Normally an LNG tanker is powered by steam turbines with boilers. These boilers are dual fuel and can run on either methane or oil or a combination of both. The gas produced in boil off is traditionally diverted to the boilers and used as a fuel for the vessel. Before this gas is used in the boilers, it must be warmed up to roughly 20 °C by using the gas heaters. The gas is either fed into the boiler by tank pressure or it is increased in pressure by the LD compressors. What fuel the vessel runs on is dependent on many factors which include the length of the voyage, desire to carry a heel for cooldown, price of oil versus price of LNG. Minimum boil-off/maximum oil:- In this mode tank pressures are kept high to reduce boil off to a minimum and the majority of energy comes from the fuel oil. This maximises the amount of LNG delivered but does allow tank temps to rise due to lack of evaporation. The high cargo temps can cause storage problems and offloading problems. Maximum boil-off/minimum oil:- In this mode the tank pressures are kept low and you have a greater boil-off but still there is a large amount of fuel oil used. This decreases the amount of LNG delivered but the cargo will be delivered cold which many ports prefer. 100% gas:- Tank pressures are kept at a similar level to max boil off but this is not enough to supply all the boilers needs so you must start to "force". A small pump is started in one tank to supply LNG to the forcing vaporiser, where the LNG is warmed and vaporized back into a gas that is usable in the boilers. In this mode no fuel oil is used. Recent advances in technology reliquefication plants to be fitted to vessels, allowing the boil off to be reliquefied and returned to the tanks. Because of this, the vessels' operators and builders have been able to contemplate the use of more efficient slow-speed Diesel engines (previously most LNG carriers have been steam turbine-powered). Exceptions are the LNG carrier Havfru (built as Venator in 1973), which originally had dual fuel diesel engines, and its sister-ship Century (built as Lucian in 1974), also built with dual fuel gas turbines before being converted to a diesel engine system in 1982. Vessels using Dual or Tri-Fuel Diesel Electric, respectively DFDE e TFDE, propulsion systems are now in service. Wikimedia Commons has media related to LNG carriers. ^ "2017 World LNG Report" (PDF). IGU(International Gas Union). ^ Gold, Russell (7 June 2017). "Global market for natural gas has finally arrived". The Australian. Retrieved 7 June 2017. ^ Kravtsova, Ekaterina (15 April 2019). "LNG transport is where the big money is". Cyprus Mail. Retrieved 15 April 2019. ^ Jane Chung, Yuka Obayashi (19 November 2018). "South Korean shipbuilders' lock on LNG tanker market to hold for years". Reuters. Retrieved 20 November 2018. ^ "Korea's first LNG-fueled bulk carrier goes in service next year | Hellenic Shipping News Worldwide". www.hellenicshippingnews.com. Retrieved 7 January 2018. ^ "Unique ice-breaking LNG carrier Christophe de Margerie ready to serve Yamal LNG project". Hellenic Shipping News. 31 March 2017. Retrieved 24 August 2017. ^ McGrath, Matt (24 August 2017). "First tanker crosses northern sea route without ice breaker". BBC. Retrieved 24 August 2017. ^ "Christophe de Margerie Class Icebreaking LNG Carriers, Russia". Ship Technology. Retrieved 24 August 2017. ^ Ulvestad, Marte; Overland, Indra (2012). "Natural Gas and CO2 price variation: Impact on the relative cost-efficiency of LNG and pipelines". International Journal of Environmental Studies. 69: 407–426 – via https://www.researchgate.net/publication/261221877. ^ "GTT Mark III Technology". Gaztransport & Technigaz (GTT) via YouTube. 7 November 2013. ^ a b "Membrane Containment System". North West Shelf Shipping Services Company (NWSSSC) Pty. Limited. 2014. ^ "GTT NO 96 Technology". Gaztransport & Technigaz (GTT) via YouTube. 7 November 2013. ^ a b c Pitblado. "Consequences of LNG marine incidents" (PDF). www.energy.ca.gov. ^ Mokhatab, Saeid; Mak, John Y.; Valappil, Jaleel V.; Wood, David A. (15 October 2013). Handbook of Liquefied Natural Gas. Gulf Professional Publishing. ISBN 9780124046450. ^ "Methane: The other important greenhouse gas". Environmental Defense Fund. Retrieved 15 November 2017.